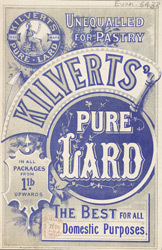 Samuel Kilvert lived in Sale in Cheshire and the lard that he developed was used in kitchens across the country. Up to the 19th-century, fat was relatively expensive and butter was a luxury. The poor lived mainly on potatoes and bread, which were cheap, supplemented whenever possible with whatever source of protein and fat they could afford. Lard was used for cooking and when hardened it was also spread on bread and eaten as a snack.